^ X2 (12A). British Board of Film Classification. 2003-04-16 [2016-05-02]. 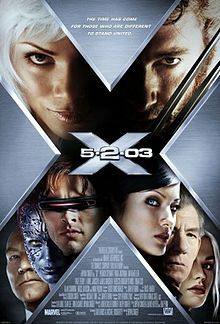 ^ 2.0 2.1 2.2 2.3 X2: X-Men United (2003). Box Office Mojo. [2008-03-06]. ^ 3.0 3.1 Schmitz, Greg Dean. Greg's Preview – X2: X-Men United. Yahoo!. [2008-08-09]. （原始内容存档于2008-01-09）. ^ X-Men 2 Poster #6. IMPAwards.com. [2012-08-20]. （原始内容存档于2015-08-01）. ^ X-Men 2 Poster #7. IMPAwards.com. [2012-08-20]. （原始内容存档于2015-07-22）. ^ Brown, Scott. EW tracks the evolution of X2. Entertainment Weekly. 2003-05-09 [2008-02-18]. （原始内容存档于2015-05-12）. ^ Bunches of Marvel. (Comics2Film column; seventh item down) Comic Book Resources. 2002-08-14 [2007-05-01]. （原始内容存档于2015-08-29）. ^ Fantastic Four: The Comedy?!. IGN. 2001-04-28 [2008-03-09]. （原始内容存档于2014-02-27）. ^ 10.0 10.1 Stax. Lauren Shuler Donner Talks X-Men 2 and Constantine. IGN. 2001-06-15 [2008-03-09]. ^ Stax. "Closing In" on X-Men 2. IGN. 2001-11-07 [2008-03-09]. ^ Grove, Martin A. Fox's X2 marks spot as presummer starts May 2. The Hollywood Reporter. 2003-04-11 [2007-04-15]. （原始内容存档于2007-09-30）. ^ Stax. Magneto Escapes!. IGN. 2002-05-08 [2008-03-09]. ^ Worley, Rob. X-Men 2 [first of two Worley articles of this title]. (Comics2 Film column; third item down) Comic Book Resources. 2002-10-23 [2008-02-18]. （原始内容存档于2015-05-01）. ^ Worley, Rob. X-Men 2 [second of two Worley articles of this title]. (Comics2Film column) Comic Book Resources. 2002-10-30 [2008-02-18]. （原始内容存档于2004-01-21）. ^ X2: X-Men United. Rotten Tomatoes. [2015-08-24]. ^ X2: X-Men United (2003): Reviews. Metacritic. [2008-03-06]. ^ Linder, Brian. This Weekend at the Movies: X2 Debuts. IGN. 2003-05-02 [2008-03-09]. ^ Marvel Comics Movies. Box Office Mojo. [2008-03-05]. ^ 2003 Yearly Box Office Results. Box Office Mojo. [2008-03-05]. ^ X2 DVD Release Date DVDs ReleaseDates, Retrieved August 29, 2015.